Chopsuey is a chinese dish. 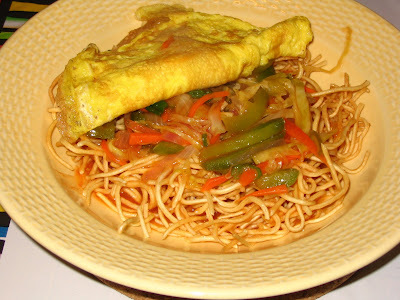 Most of the restaurants in India they have two types of chopsuey one is American chopsuey which is served as deep fried noodles with tomato based sauce and Chinese chopsuey which is soya based sauce served with deep fried noodles. Both are fusion because they prepare according to our taste buds. Here I am giving the recipe for American chopsuey. Which I wanted to share with you all. So give a try. Please feel free to drop your suggestions. Salt and pepper - as required. Topped with egg omelette while serving. noodles in batches. Drain it in a tissue then store it in a airtight container. You can do this process ahead of one day if you feel them complicated. In a frying pan add onions then garlic ginger, now add carrot saute for few minutes, add capsicum and cabbage, then all the sauce pepper and salt. Now add a cup water and when it comes to boil add the cornflour mixture.The sauce starts to thicken. If they do not thicken just add some more cornflour mixture.Now in the serving plate crush fried noodles pour the hot sauce over it garnish with spring onion and top with egg omelette or scrabbled eggs .Serve this piping hot. Pour the sauce only when you serve, otherwise noodles becomes soggy. With vegetables you can add sliced mushroom too.Do not saute the vegetables for long time it should be crunchy and do this in high flame. wow tat was really well spun concept of deliberate fusion. well got to try tat soon, once return back to home! Keep rocking mate!